The drug is used for external mycoses (saprolegnose), protozoan invasions (ihtiotiroidism, crypto-karyonosis, trichodiosis, odinosis, amylodinosis, coezezosis, chylodonellosis, brooklinelosis, amoebiasis, epiosis). Antipar contains: formaldehyde – 10%, green malachite green – 0.2% and distilled water. Antipart has antiparasitic, antimicrobial and antimycotic action against (Piscinoodinium, Ichthiophithirius multifiliis, Cryptocaryon irritans, Dactylogyrus, Ciliophora, Holotricha, Dinoflagelatta, Mastigophora, Ghirodactylus, Trihofria, Uronella, Tertahymena, Brooklynella, Oostinium, Trihodina, Chilodonella, causes fish diseases. 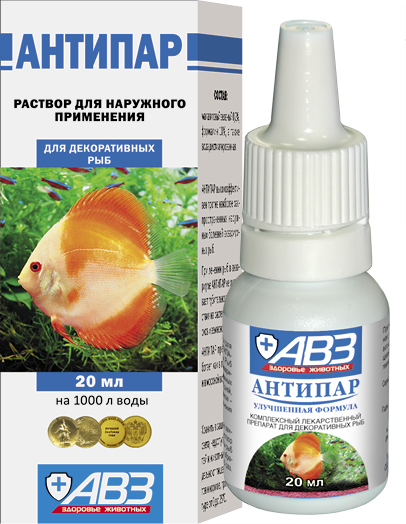 Antipara favors the healing of traumatic diseases in fish. Antipar is given by the long and short-duration baths method. For preventive purposes, short-term baths are administered with the preparation in a dose of 1 ml / 10 l water with the exhibition – 3 hours. Previously, from an unfavorable aquarium (basin) some fish with obvious symptoms are moved into a vessel (1 ml / 10 l water) and followed for 15 minutes. In case of anxiety (uncoordinated sudden movements) the fish move into clean water. In the absence of complications, all the fish in the aquarium (basin) are bloated. For the procedure, the fish is caught in the juvenile and is placed in the curative solution for 3 hours. At the end of the term, the juvenile moves into the basin where it is left until the next processing. After finishing the fish is released from the juvenile. To treat sensitive fish and juveniles, long-lasting baths are used. For this purpose, Antipar is placed in the aquarium (basin) at a dose of 1 ml / 50 l of water, disconnects illumination and improves aeration. During the treatment, ½ of the curative dosage is added every 3 days in water. The filters are not used for the duration of the treatment, the plants and the accessories are not removed from the aquarium. The temperature in the aquarium is maintained at + 240C + 260C and pH 5.5-6.8. After treatment, the aquarium water is turned off by being cleaned through the charcoal filter. If necessary, the cure is repeated over 5 days. A special inventory (coin, nourishing, juvenile, thermometer, scraper, etc.) is allocated to the sick fish aquarium. In the event of overdosage, disbalances and disturbances of coordination of movements (chaotic movements) occur. In this case, the fish moves into a pot of clean water. Violation of the treatment schedule leads to less effective treatment. If a bath is avoided, it should be done as soon as possible in the recommended dosage. Fish feeding is possible within 2 hours of starting treatment, using live feed. Uncooked food is removed from the aquarium. The drug is produced in 20 ml polymer bottles in a cardboard box. Store in the original package. Protected from light and humidity. Keep out of reach of children and animals. Store separately from food and animal feed at 10 – 20 ° C.
2 years from the date of production.